V798 OLS, Volvo FL618 Emergency One, Rescue Truck. Stationed at Alloa Fire Station. Added by A LFC from CSFRS/CSFB on 15 July 2006. Perhaps someone can tell me what the difference is between a SSU and a Rescue Truck ??? Added by Marcel Sloover on 17 July 2006.
just a different name that i believe only CSFRS use. Added by A LFC from CSFRS/CSFB on 18 July 2006. This is equipped with heavy cutting and lifting equipment, rope rescue equipment, the quad-pod, inflatable walkways, lighting units and it also has a Hi-Ab crane on the rear. 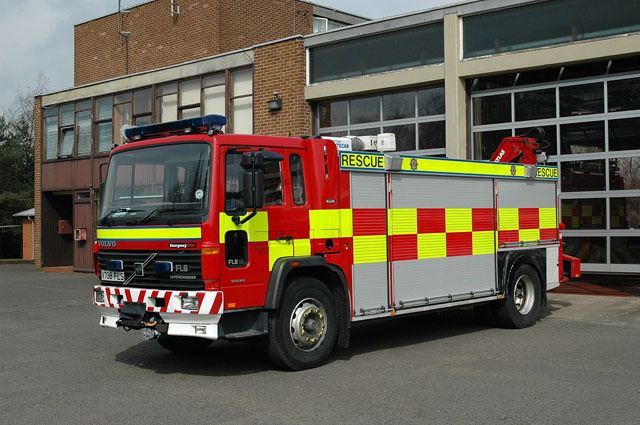 It gets sent to special service calls in the Central Scotland Fire Service Area. Added by Nathan Smith on 19 July 2006. Added by A LFC from CSFRS/CSFB on 20 July 2006. Added by Marcel Sloover on 20 July 2006. Added by Butter on 03 November 2006. Added by Zander on 18 February 2008. Added by Jake Sutton on 18 February 2008. I have met the watch manager and the crew, they call it a Rescue Tender. Added by Conroy on 17 April 2010.